Orange County’s Office of Emergency Management is advising residents to stay vigilant and informed on the path of Hurricane Irma. Even though the brunt of the storm will be to the west of the region, Orange County must still prepare. Now that Orange County’s curfew is in effect, residents should be sheltered in place and safe. Almost all of Central Florida remains under a tornado warning. The mandatory countywide curfew is in effect from Sunday, Sept. 10 at 7 p.m. through Monday, Sept. 11 at 6 p.m. This curfew will not apply to emergency responders, employees at hospitals and health care facilities and critical staff for businesses that provide essential services. The Orange County Emergency Operations Center is activated at a Level 1. For official Orange County emergency information, please visit www.ocfl.net/Irma. 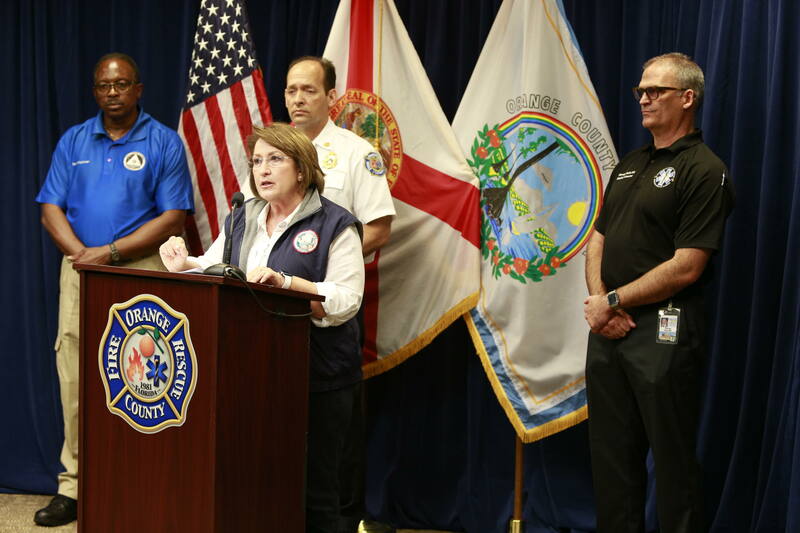 For official information on all shelters, as well as full emergency preparedness plans, visit Orange County’s official website www.ocfl.net/storm. Orange County continues to monitor storm activities and hot spots as they appear. Orange County expects to experience strong tropical-force winds starting at 9 p.m. Sunday until noon on Monday. Based on the current forecast, the western portion of Orange County is predicted to experience hurricane-strength winds between midnight and 4 a.m. Remember, that this is a current projection and hurricanes are unpredictable. Orange County Fire Rescue already has crews on standby ready to deploy post-storm activities. Orange County Fire Rescue has reached 100 percent saturation of messages to people living in mobile homes. Between the hurricane-force winds expected on the west side of Orange County and potential for tornados, if anyone is still in a mobile home, you are urged evacuate now. If you are evacuating to one of our shelters, you are exempt from the curfew. Out of our 18 total shelters – including three Persons with Special Needs Shelters – Orange County is at 35 percent overall capacity, with secondary shelters opening. Orange County is housing 4,200 people at local shelters and more than 200 pets. Each of Orange County’s 41 fire stations are equipped with a weather monitoring device that helps capture wind speeds. Once the winds hit 50 mph sustained, or wind gusts of 65 mph, Orange County Fire Rescue will cease roadway operations until it is determined to be safe. At the height of the storm, responders will be unable to respond to calls for safety concerns. However, if you have an emergency, still call 9-1-1 and they will respond as soon as possible, and our 9-1-1 operators may be able to provide assistance to you over the phone. If you see a downed power line, assume it is live. Stay a safe distance away and contact 3-1-1 either by phone or Orange County’s 3-1-1 app. If using our app, you have the capability to pinpoint the powerline via geolocation. If you encounter a traffic signal that is out, treat it like a four-way stop and report it to 3-1-1. Please report any damages and power outages in your homes to your power or utility provider and then call 3-1-1. Even after the storm passes, there is still danger. Stay indoors and stay cautious of debris and fallen trees. Please let the winds subside before beginning to move any debris.